Expressed on tissue-resident macrophages, the receptor tyrosine kinase, recepteur d’orgine nantais (RON), functions to maintain inflammation homeostasis by activating genes that promote wound repair and resolve inflammation while repressing genes that perpetuate tissue damage and cell death. Chronic HIV-1 infection is associated with dysregulated inflammation, and we hypothesize that diminished RON expression contributes to the development of end organ diseases such as HIV-1–associated CNS disease. To explore RON function in vivo, we used CNS tissue from a well-characterized SIV macaque model and examined the temporal regulation of RON in the brain during the course of infection. Following prolonged SIV infection, RON expression was inversely correlated with the development of CNS disease; RON was maintained in animals that did not develop CNS lesions and was reduced in SIV-infected macaques that demonstrated moderate to severe inflammatory lesions. Arginase-1 expression was reduced in the brain during late infection, whereas expression of the inflammatory genes, IL-12p40 and TNF-α, was elevated. To validate a role for RON in regulating HIV-1 in primary cells, we used human tissue-resident macrophages isolated from tonsil as a tractable cell model. RON signaling in tissue-resident macrophages, both ligand dependent and independent, limited HIV-1 replication. Furthermore, prolonged HIV-1 infection in vitro resulted in downregulation of RON. We propose a model in which, following chronic HIV-1 infection in the brain, RON expression is decreased, genes that quell inflammation are repressed, and inflammatory mediators are induced to promote tissue inflammation. Recepteur d’orgine nantais (RON) receptor tyrosine kinase, a member of the MET proto-oncogene family of receptor tyrosine kinases, functions to maintain inflammation homeostasis (1, 2). RON is expressed on tissue-resident macrophages, including cells of the bone (3), liver (4), skin (5), peritoneal cavity (6), and macrophages and microglia of the brain (7), whereas circulating monocytes do not express RON (7). RON and its ligand, macrophage-stimulating protein (MSP), regulate tissue-resident macrophage function in part by activating genes, such as arginase-1 (Arg-1) (8), IL-1R antagonist, and scavenger receptor A (9), which promote tissue repair and resolve inflammation while repressing proinflammmatory molecules, including TNF-α (10), IL-12p40 (11, 12), and inducible NO synthase (iNOS) (13). RON−/− mice exhibit increased inflammation, cytokine production, tissue damage, and death upon LPS challenge (4, 14). These mice are also prone to organ-specific inflammatory diseases, including experimental allergic encephalitis (15), bacterial peritonitis (16), and acute lung injury (17), and are more susceptible to Listeria monocytogenes infection (18), suggesting compromised cell-mediated immunity. Therefore, RON has a central role in protecting organs, including the brain, from ectopic inflammation. The CNS is a primary target of HIV-1, with evidence of infection in brain macrophages and microglia within 2 wk after initial transmission of the virus (19, 20). Infection of cells within the CNS establishes potential long-term HIV-1 reservoirs (21, 22) and triggers inappropriate inflammation and tissue damage (23). Although use of highly active antiretroviral therapy has decreased the severity of AIDS-associated CNS diseases, incidence and persistence of neurologic disease remain prevalent (24). The inability of highly active antiretroviral therapy to decrease CNS disease may reflect the fact that current treatments target viral replication and not immune dysfunction associated with HIV-1 infection (25, 26). Following HIV-1 and SIV infection in the brain, proinflammatory cytokines and cytotoxic factors, such as TNF-α, IL-12, IL-6, IFN-β, IL-1β, and NO, are secreted by perivascular macrophages and microglia (27–29). Release of these factors promotes neuronal cell death. Excessive damage to neurons propagates the inflammatory response, by further activating macrophages and microglia, which release additional cytotoxic factors (23). Prolonged viral infection and excessive inflammation contribute to enhanced HIV-1 replication and HIV-1–associated CNS disease. The mechanisms that initiate and sustain this inflammation are poorly understood. Previous work from our laboratory has shown that RON represses HIV-1 transcription (7, 30), but the receptor is targeted for degradation by HIV-1-Tat (31). Furthermore, expression of RON is reduced in postautopsy brain tissue of patients with HIV-1–associated encephalitis (7), indicating that a loss of this protective mechanism results in HIV-1–associated tissue inflammation. However, to appreciate its role in HIV-1 pathogenesis, it is critical to evaluate the function and expression of RON during the course of infection in primary tissue-resident macrophages and not solely as a terminal endpoint. We propose that signaling through RON limits HIV-1 transcription, establishing reservoirs of infected tissue-resident macrophages. With time, possibly as a result of chronic inflammation and/or HIV-1 infection, RON expression is decreased and inflammation is exacerbated, resulting in a microenvironment that favors HIV-1 transcription, virus spread, and tissue damage. In this study, we use an established macaque infection model for accelerated SIV-associated CNS disease (32), as well as primary tissue-resident macrophages, to investigate the relationship among RON, HIV-1 replication, and HIV-1–associated inflammation. Pigtail macaques were infected with SIV in accordance with federal guidelines and institutional policies, as previously described (33). CNS disease lesion score was performed, as previously described (33), and based on histological sections and semiquantitative analysis of perivascular macrophage cuffs; sections containing >30 cuffs were scored 3, those containing 10–30 cuffs were scored 2, and those with <10 cuffs were scored 1. The recorded score is the average of six sections for each animal. RNA from basal ganglia was shipped on dry ice overnight. Viral load in basal ganglia (SIV RNA copy equivalent/μg brain RNA) was analyzed by RT-PCR, as previously described (27). A summary of animals analyzed is provided in Table I.
Tonsil explants were obtained from National Disease Research Interchange or discarded deidentified tissues from otolaryngology surgeries performed at Boston Medical Center. The use of discarded tissues was reviewed by the Boston University Medical Center Institutional Review Board and determined to be exempt human subject research. Tonsil tissues were mechanically separated under sterile conditions in serum-free DMEM with 100 U/ml penicillin and 100 U/ml streptomycin (P/S) and homogenized using a large tissue grinder (Kendall). The homogenate was passed through a 70-μm nylon filter (BD Falcon), resulting in a single-cell suspension that was enriched for mononuclear cells by centrifuging through Histopaque 1077 (Sigma-Aldrich). Cells were washed three times in PBS and cultured at 1.0–2.0 × 107 cells/ml in DMEM supplemented with 10% FBS and P/S. Cells were serum starved for 2 h, washed, and provided fresh DMEM with 10% FBS, P/S, and 50 μg/ml Fungizone antimycotic (amphotericin B; Invitrogen). Adherent cells were differentiated on plastic for 7 d, with PBS washes and media changes every 2–3 d.
MSP (R&D Systems) was used at 100 ng/ml as either a pretreatment overnight prior to cytokine stimulation, or 24 h following infection. IFN-γ (R&D Systems), at 1000 U/ml, and LPS (Sigma-Aldrich), at 10 μg/ml, were used to stimulate cells in vitro for 4 h.
Infectious stocks of HIV-1 were generated by transfecting 293T cells with 15 μg pBaL, pNL4.3 or pNL4.3-Nef+-HSA (National Institutes of Health AIDS Research and Reference Reagent Program), and 3 μg RSV-Rev using calcium phosphate (30). For some experiments, pNL4.3Nef+-HSA was transfected with 3 μg vesicular stomatitis virus envelope glycoprotein (VSV-G) to pseudotype the virus with this envelope. Transfection efficiencies were estimated with a positive control transfection of 3 μg p-eGFP, and titers were determined by p24 ELISA (Perkin Elmer). Supernatants with virus were harvested and filtered through a 0.45-μm disc at 48 h posttransfection. Approximately 1 × 106 pg/ml p24 of infectious virus was added to each well for infection. Twenty-four hours postinfection, cells were washed twice to thoroughly remove initial infectious virus; media was changed and treated with MSP or small interfering RNA (siRNA). Supernatants were collected from infected cells, and virus replication was monitored by ELISA for p24 Gag (Perkin Elmer). RON (MST1R) OnTarget plus SMARTpool siRNA (25 nM; Dharmacon) and control nontargeting SMARTpool siRNA (25 nM; Dharmacon) were transfected into tissue-resident macrophages 24 h postinfection using TransIT-TKO transfection reagent (Mirus). Transfection reagents were prepared in serum-free DMEM and 1/100 vol of TransIT-TKO reagent and allowed to equilibrate at room temperature for 20 min before adding siRON or siNontargeting poll siRNA for an additional 20 min at room temperature. For transfection of siRNA in 6-well plates, ∼1 × 106 tonsil-derived macrophages were washed with PBS twice to remove initial infectious virus and replenished with 1.25 ml 10% FBS DMEM plus P/S, and 240 μl siRNA transfection mixture was added dropwise to cells. siRNA transfections of 1 × 107 cells in 10-cm plates were performed with 9 ml DMEM-transfection mixture. Transfection reagents were incubated with cells for 48 h, and cells were collected for RNA and protein. Whole-cell lysates were generated using lysis buffer containing 0.1% Nonidet P40 in the presence of proteinase inhibitor mixture set III (Calbiochem). Lysates were run on 8% SDS-PAGE and transferred onto polyvinylidene difluoride membrane. Membranes were blocked in 5% nonfat milk (NFM) overnight and blotted overnight with rabbit anti-human RON Ab (Santa Cruz Biotechnology) or mouse anti-human actin (Sigma-Aldrich), in 5% NFM, at concentrations of 1:5,000 and 1:10,000, respectively. Membranes were washed three times in PBS with 0.05% Tween 20 and then blotted for 1 h with HRP anti-rabbit and HRP anti-mouse, in 5% NFM, at concentrations of 1:10,000 and 1:20,000, respectively. After washing with PBS with 0.05% Tween 20 three times and one wash with PBS alone, membranes were treated with ECL Plus chemiluminescence reagent (GE Healthcare) for 5 min and exposed to film. Tissue-resident macrophages were harvested at day 7 with Versene (Invitrogen) and minimal agitation to release adherent cells. Cells were washed in cold PBS, and 0.5–1 × 106 cells were allotted to each tube. Prior to primary Ab incubation, FcR blocking reagent (Miltenyi Biotec) was added in a buffer of PBS with 0.5% BSA and 2 mM EDTA. Cells were stained with FITC mouse anti-human CD14 (BD Biosciences), FITC mouse anti-human CCR5, PE-Cy5 mouse anti-human CD16, PE-Cy5 mouse anti-human CD206 (BD Biosciences), anti-human CXCR4 (AIDS reagents program), and FITC mouse IgG2aκ (BD Biosciences). Cells were fixed in 2% paraformaldehyde and analyzed using the BD Biosciences FACScan at the Flow Core Facility at Boston Medical Center. Histograms were gated on macrophage populations determined by forward scatter/side scatter plots, to exclude dead cells. Gated population represented ∼70% of total events. RNA from basal ganglia was extracted, as previously described (34). Representative animals from uninfected (3 of 6 animals), day 42 post-SIV infection (4 of 9 animals), and day 84 post-SIV infection (6 of 9 animals) were analyzed. RNA from in vitro cultures was extracted using TRIzol reagent (Invitrogen). RNA from brain and in vitro cultures was reversed transcribed using SuperScript II Reverse Transcriptase (Invitrogen). Real-time RT-PCR was performed using Go Taq Master Mix (Promega) and analyzed with ABI Prism 7000 Sequence Determination Software (Applied Biosystems). Arg-1, RON, and TNF-α primers have been previously described (9, 11, 31): IL-12p40 sense, 5′-GCGTGCAAGCTCAGGATCG-3′; IL-12p40 antisense, 5′-CGCAGAGCCAGGGAGCTAA-3′. HIV-1–elongated transcripts that amplify a region ∼5 kb from the transcriptional start site have been previously described (35). β-actin internal control primers were commercially available (Qiagen). Arg-1, TNF-α, IL-12p40, and HIV-1 relative expression was calculated using the Δ-Δ cycle threshold method using β-actin as an internal control and uninfected conditions as the calibrator. RON expression was calculated with a standard curve using RON and actin plasmid DNAs. Statistical analysis was performed using a Student t test, two-tailed distribution, and assuming equal variances. Power analysis was completed, to state at a 5% confidence level, so that the sample sizes used for the animal model were large enough to confidently conclude statistically significant differences. Furthermore, the nonparametric Wilcoxon-Mann–Whitney U test was used as secondary analysis of in vivo data, and results were comparable to those calculated using the Student t test. The Pearson’s correlation coefficient (r) was calculated comparing RON real-time RT-PCR data with the presence (1) or absence (0) of CNS disease lesions and the SIV viral load in the basal ganglia (SIV RNA copy equivalent/μg brain RNA). Viral load data were log transformed to fit a linear regression. The t statistic was calculated, and the t-distribution, with n-2 df, and a two-tailed distribution, was used to determine the p value for the correlation coefficient. Reduced RON expression has been observed in brain tissue from HIV/AIDS (7) and multiple sclerosis patients (15), suggesting a correlation between inflammatory insult in the brain and the absence of RON. To gain a better understanding of RON expression in vivo during disease progression, we used a temporal model of SIV-associated CNS inflammation in pigtail macaques, which recapitulates HIV-1 CNS pathogenesis, including encephalitis and behavioral changes (32, 35). Macaques were infected with two SIV variants, as follows: an immune-suppressive variant (SIV/Δ B670) and a neurovirulent variant (SIV/17E-Fr) (36). Within 3 mo of SIV infection, 90% of infected pigtail macaques develop inflammatory lesions, providing a consistent, accelerated model to study the dynamic events contributing to SIV-associated CNS disease (Table I). Using real-time RT-PCR, RON mRNA was detected in the brains of uninfected and SIV-infected pigtail macaques (Fig. 1A). During acute SIV infection, RON expression was initially reduced by 75% compared with uninfected control RON mRNAs, but rebounded within a few days to uninfected levels before declining again to 60% below controls by day 21 (Fig. 1A). Repression of RON expression continued through the asymptomatic and into the chronic stage of infection. At days 56 and 84 postinfection, when CNS disease lesions are evident in 90% of the animals (32), we observed a >60% decrease in RON expression compared with uninfected controls (Fig. 1A). RON expression negatively correlated (Pearson’s correlation coefficient of r = −0.77) with CNS disease lesions during chronic infection, as scored by the presence of perivascular macrophage cuffs (Fig. 1C). This correlation (r = −0.80) was particularly evident at day 42 (Fig. 1D), a time point in which we observed variable disease symptoms and RON expression. Day 42 animals, with no indices of CNS disease, expressed significantly more RON than animals that showed evidence of mild to severe CNS lesions, which expressed 60% less RON (Fig. 1B). Comparing RON expression with viral load data also showed a negative correlation between SIV RNA levels in the brain and RON (r = −0.48; Fig. 1C); animals with low viral loads had higher RON expression than animals with elevated viral loads. This correlation (r = −0.80) was especially apparent at day 42 (Fig. 1D). RON is inversely correlated to CNS disease severity in parietal cortex of pigtail macaques. (A) Quantitative real-time RT-PCR analysis for RON normalized to β-actin was performed using cDNA from parietal cortex isolated following sacrifice of infected and uninfected control macaques at the indicated times. Qualitative real-time RT-PCR analysis of RON transcripts was normalized to β-actin, and expression was calculated based upon RON and β-actin plasmid DNA standard curves. Each point represents a different animal. (B) Presence of CNS disease lesion was determined based upon the presence of perivascular cuffs of macrophages in tissue samples, as previously described (33). RON expression, presented above, is shown here in relationship to disease severity at each stage of the infection (*p < 0.05, **p < 0.001). (C) Pearson’s correlation coefficients (r) were calculated using RON expression, presented above, and presence of CNS disease lesions (top panel) or basal ganglia viral load (SIV RNA copy equivalent/μg brain RNA) (bottom panel) in SIV-infected macaques at days 42, 56, and 84 postinfection (*p < 0.05, **p < 0.001). The best fit least squares regression line is shown. Each point represents a different animal. (D) Pearson’s correlation coefficients (r) were calculated using RON expression, presented above, and presence of CNS disease lesions or basal ganglia viral load (SIV RNA copy equivalent/μg brain RNA) in SIV-infected macaques at day 42 postinfection (**p < 0.001). RON expression was used to calculate correlation coefficient. The best fit least squares regression line is shown. Each point represents an individual animal. RON regulates inflammation in part by inhibiting transcription of cytokines such as IL-12p40 and TNF-α (11, 37) and promoting the expression of enzymes required for wound repair, including Arg-1 (8, 9). Moreover, Arg-1 competes with iNOS for the substrate, l-arginine, thereby indirectly acting as an anti-inflammatory factor (38). We would predict that reducing RON expression in the CNS of SIV-infected macaques would lead to an increase in inflammatory cytokines normally repressed by RON. We observed a 5-fold increase in IL-12p40 expression at day 42 postinfection as well as significantly elevated expression of IL-12p40 at day 84 (Fig. 2A). TNF-α expression was also significantly elevated compared with uninfected controls at days 42 and 84 postinfection (Fig. 2B). During chronic SIV infection, Arg-1 expression in the CNS was reduced by 70% compared with expression in uninfected controls (Fig. 2C). The overall increase in IL-12p40 and TNF-α and decrease in Arg-1 corresponded with reduced RON expression observed at these time points (Fig. 1A). Taken together, these results are consistent with RON having a protective role in the brain and that compromising its expression and function by SIV infection exacerbates inflammation. IL 12p40, TNF-α, and Arg-1 expression correlated with RON expression. Quantitative real-time RT-PCR analysis for (A) IL-12p40, (B) TNF-α, and (C) Arg-1 expression normalized to β-actin expression was performed using cDNA from parietal cortex. Relative expression was determined using uninfected control expression as a calibrator and the Δ-Δ cycle threshold method (*p < 0.05, **p < 0.001). A representative group of animals at each day post-SIV infection was used for cytokine analysis (3 uninfected animals, 4 animals from day 42, and 6 animals from day 84). Each point represents a different animal. To test whether RON directly impacts HIV-1 transcription, we used human primary tissue-resident macrophages derived from tonsil (39–41). Tonsil tissue is accessible, and tonsil-derived macrophages are susceptible to HIV-1 infection (42, 43). Furthermore, human tonsil tissue-resident macrophages have been a useful model for studying HIV-1 infection of tissue-resident macrophages, and the tonsil has been proposed as a potential reservoir for HIV-1 (22, 44–47). Mononuclear cells were isolated from tonsils and allowed to mature into macrophages on plastic for 7 d. These cells express RON (Fig. 3A) and are positive for surface CD14 expression (Fig. 3B), as well as CD16, mannose receptor CD206, and CXCR4 and CCR5 (Fig. 3B), markers consistent with tissue-resident macrophages. Pretreatment with MSP, the ligand for RON, followed by stimulation with LPS and IFN-γ, resulted in a 70% decrease in inducible IL-12p40 expression (Fig. 3C). Additionally, a 5-fold increase in Arg-1 expression was evident in the tissue macrophages pretreated with MSP (Fig. 3C). These data suggest that we have enriched for tissue-resident macrophages that express functional RON, thus providing a tractable primary cell model to examine the ability of RON to influence HIV-1 replication. RON is expressed and functional on human tissue-resident macrophages. (A) Whole-cell lysates were prepared from human tissue-resident macrophages enriched from tonsils from two donors, as described in Materials and Methods. Lysates were run on 8% SDS-PAGE, transferred to membranes that were probed with Abs against human RON or human β-actin. (B) Tissue-resident macrophages were treated with FcγR-blocking reagent and stained with fluorescently labeled Abs against CD14 (mean fluorescence intensity [MFI] = 54.40), CXCR4 (MFI = 55.19), CCR5 (MFI = 33.45), CD16 (MFI = 19.08), and CD206 (MFI = 19.77) and appropriate isotype controls. Stained cells were fixed in 2% paraformaldehyde and analyzed on the BD FACScan. (C) Quantitative real-time RT-PCR analysis for IL-12p40 and Arg-1 expression, normalized to β-actin expression, was performed using cDNA from tissue-resident macrophages. Relative expression was determined using uninfected control expression as a calibrator. Clear bars represent unstimulated conditions, and black bars represent cells stimulated with LPS (10 μg/ml) and IFN-γ (1000 U/ml) for 4 h (*p < 0.05, **p < 0.001). Data are representative of three experiments with triplicate stimulations. Tissue-derived macrophages were infected in vitro with BaL-HIV-1, a CCR5 tropic virus, the CXCR4 tropic NL4.3, or HIV-1 NL4.3 pseudotyped with VSV-G envelope. Following 48-h treatment of infected cells with MSP, HIV-1 replication was reduced by 65% compared with untreated infected cells at day 3 postinfection, as measured by p24 ELISA (Fig. 4A). HIV-1 transcription was also significantly reduced by MSP regardless of envelope used for infection (Fig. 4B–D), consistent with previous reports that RON limits provirus transcription (7, 30). MSP limits HIV-1 replication in human tissue-resident macrophages. (A and B) Tissue-resident macrophages were infected with NL4.3 psuedotyped with VSV-G overnight. Cells were washed twice with PBS, and provided fresh media ± MSP (100 ng/ml). (A) Cell-free supernatants were collected 3 d postinfection, and p24 Gag in the supernatant was measured by ELISA. (B) Quantitative real-time RT-PCR was performed to determine HIV-1 transcription following MSP treatment. Values were determined by Δ-Δ cycle threshold method with HIV being normalized to β-actin, and relative expression was determined using uninfected controls as a calibrator. (C and D) Tissue-resident macrophages were infected with (C) NL4.3 and (D) BaL and treated with or without MSP, as described. Quantitative real-time PCR was used to measure HIV transcription normalized to β-actin, as described above. *p < 0.05, **p < 0.001. It has been suggested that RON signals constitutively in the absence of ligand (48) and this constitutive signaling contributes to a partial barrier to HIV-1 replication (7, 30). RON expression was knocked down in tissue-resident macrophages to determine whether RON, independent of ligand, inhibited HIV-1. Following 24-h infection, RON expression was knocked down with siRNA and, 48 h postknockdown, an 88% reduction in RON expression was observed at the mRNA level, which was validated by immunoblots (Fig. 5A, 5B). A 2-fold increase in HIV-1 p24 was detected following RON knockdown (Fig. 5C). Consistent with the observation that RON acts postentry and at the level of HIV-1 transcription regulation (7, 30), diminishing RON expression increased HIV transcription regardless of the envelope used (Fig. 5D, 5E). Taken together, these data indicate that RON limits HIV-1 in the presence and absence of its ligand in primary tissue-resident macrophages. RON limits HIV-1 transcription in human tissue-resident macrophages. (A) Quantitative real-time PCR of RON transcripts normalized to β-actin following 48 h post-siRNA RON or siControl transfections. (B) RON and β-actin immunoblots of whole-cell extracts prepared from RON siRNA- or control siRNA-treated cells. (C–E) Tissue-resident macrophages were infected overnight with (C, D) NL4.3 pseudotyped with VSV-G or (E) BaL prior to transfecting cells with siRON or siControl. (C) Cell-free supernatants were collected 3 d post-siRNA transfection, and p24 Gag in the supernatant was measured by ELISA. These cells were infected with NL4.3-VSV-G. (D and E) HIV transcription as measured by real-time RT-PCR, as described in Materials and Methods, 48 h post-siRNA RON or siControl transfections (*p < 0.05, **p < 0.001). Data are representative of three experiments with triplicate infections. Our in vivo data strongly suggest that SIV infection causes a decrease in RON expression (Fig. 1A); however, we are unable to determine whether expression is directly regulated by SIV or whether diminished RON expression reflects recruitment of inflammatory, RON-negative macrophages. Previous work from our laboratory indicated that HIV-1 directly downregulates RON expression in cell lines overexpressing RON (31). Using primary tissue-resident macrophages, we examined whether HIV-1 was directly targeting RON. RON expression in tissue-resident macrophages was monitored by RT-PCR at 21 d postinfection. HIV-1 infection decreased RON mRNA by 87% compared with uninfected controls (Fig. 6). Consistent with a lack of functional RON being expressed on these cells, MSP treatment did not affect HIV-1–mediated repression of RON expression (Fig. 6). Therefore, HIV-1 directly targets RON, possibly promoting efficient HIV-1 replication. HIV-1 infection reduces RON expression in human tissue-resident macrophages. Tissue-resident macrophages were infected with NL4.3 psuedotyped with VSV-G overnight. Cells were washed twice with PBS and provided fresh media ± MSP (100 ng/ml). RNA was collected 21 d postinfection. Qualitative real-time RT-PCR analysis of RON transcripts was normalized to β-actin, and expression was calculated based upon RON and β-actin plasmid DNA standard curves (*p < 0.05). Data are representative of two experiments with triplicate infections. The elevated levels of inflammatory cytokines observed in the CNS upon chronic HIV-1 infection suggest that control of the cytokine network is compromised. We have previously demonstrated that RON, which limits macrophage inflammatory activities, is reduced in brains of end-stage HIV-1–infected individuals with evidence of encephalitis (7). In this study, we have used a progressive macaque SIV CNS disease model to show that over time RON expression is decreased in SIV-infected macaques and that this inversely correlates with inflammatory cytokine expression and brain disease. Furthermore, in vitro studies using primary tissue-resident macrophages confirm that RON initially limits HIV-1 transcription, but, over the course of infection, receptor expression is decreased. The macaque SIV infection model provided an opportunity to explore when RON expression is decreased during infection and whether this correlates with other indicators of inflammation. The macaque model has been well characterized (32, 35), and it has been shown that the macaques develop similar symptoms in ∼80 d to the HIV-1–associated disease, which takes years to develop in humans. In both macaques and humans, elevated levels of cytokines, including TNF-α and IL-6, as well as the development of encephalitic lesions, are observed (27, 33, 49). It is at ∼day 42 when the SIV-infected macaques begin to present CNS disease symptoms and exhibit changes in the expression of cytokines and immunomodulatory molecules, including IL-12p40,TNF-α, IFN-β, IL-6, IL-10, MHC class II, MCP-1, C/EBPβ, and HIV-1 RNA (21, 27, 28, 50). Despite the variability in RON expression at this day 42 transition to chronic disease, there is a significant inverse correlation between RON, viral load, and disease in the CNS. The overall dysregulation in the inflammatory microenvironment during chronic infection may reflect the compromised activity of regulatory factors, such as RON, which are upstream of inflammatory cytokines such as IL-12p40 (11) and TNF-α transcription (10), and limit their expression. Arg-1 counters inflammation by mediating tissue repair as well as competing with iNOS for the substrate, l-arginine (38). Arg-1 is decreased in the brains of chronically SIV-infected macaques consistent with RON being upstream of Arg-1 and regulating its transcription (8, 9). Importantly, we confirmed that human tissue-resident macrophages are capable of producing Arg-1. Arg-1 has been defined as a marker for murine alternative macrophages; however, it has been reported that human macrophages do not express arginase based on transcription profiling of IL-4– or IL-13–polarized monocyte-derived macrophages (51, 52). Recent studies have challenged this original observation; peripheral monocytes isolated following trauma injury (53) and surgery (54) and macrophages found in tuberculosis granulomas (55) express Arg-1. Our data are consistent with these latter observations and suggest that RON is expressed on a spectrum of macrophage subsets. HIV-1 infects resident macrophage populations in the brain, including perivascular macrophages and microglia (19, 20). However, it is difficult to find primary or tissue culture systems that mimic CNS cells; therefore, we used tonsil-derived macrophages as a cellular surrogate for tissue-resident macrophages of the CNS. Although tissue macrophage populations are phenotypically and functionally heterogeneous, tonsil tissue is accessible, has been used as an in vitro model for human tissue-resident macrophages (39–41), is susceptible to HIV-1 infection (42, 43), and represents a potential HIV-1 sanctuary (44, 45). Tonsil macrophages preserved characteristics of tissue-resident macrophages and supported HIV-1 replication, indicating that our culture conditions preserved the tissue-resident macrophage phenotype. Furthermore, RON was functional, regulating the expression of LPS-induced IL-12p40 and Arg-1. Using the tissue-resident macrophage in vitro model, we demonstrate that RON initially inhibits HIV-1 transcription and, following prolonged infection, HIV-1 infection decreases RON expression, supporting our observations in the human (7), macaque, and cell lines (31) that HIV-1 infection leads to a downregulation of RON. We have previously shown using U937 cells overexpressing RON from a heterologous promoter that HIV-1 Tat is able to target RON protein for degradation with no significant effect on RON transcription (31). 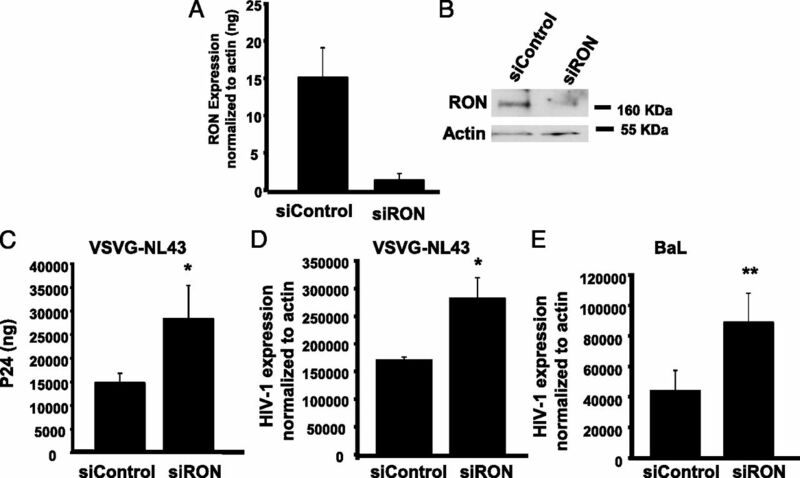 In both the SIV model and the HIV-1–infected in vitro primary cell models, RON transcription demonstrates that SIV and HIV target RON expression and function. Macrophages possess multiple intrinsic mechanisms, including RON, FcγR, and nuclear receptors, which control inflammation and limit HIV-1 infection. HIV-1 targets these inhibitory mechanisms, facilitating more efficient replication. FcγRs, which are required for recognition and phagocytosis of IgG-opsonized particles and pathogens (56), limit inflammation by inhibiting the expression of proinflammatory cytokines such as IL-12 and inducing the production of anti-inflammatory cytokines such as IL-10 (57). 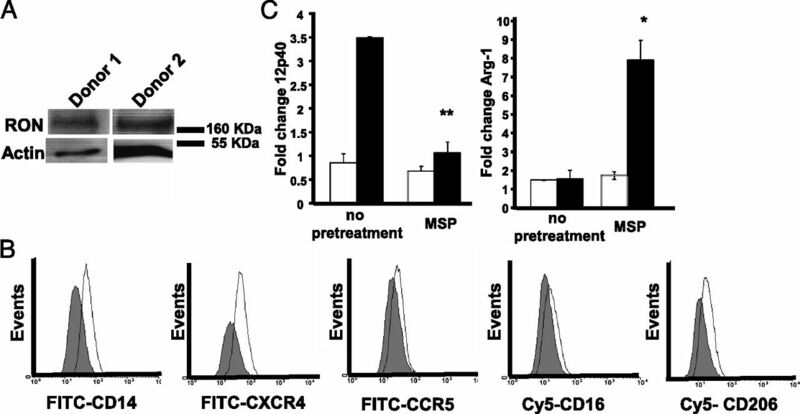 Cross-linking FcγRs inhibits HIV-1 replication in monocyte-derived macrophage (58), and HIV-1–infected macrophages have impaired FcγR-mediated phagocytic ability (59). Furthermore, polymorphisms in FcγRIIA have been associated with more rapid disease progression, suggesting a protective role of certain FcγR genotypes (60). Nuclear receptors also inhibit inflammatory responses by regulating the transcription of inflammatory mediators (61). Nuclear receptors, such as peroxisome proliferator-activated receptor γ and liver X protein, inhibit HIV-1 transcription through trans-repression, which diminishes NF-κB recruitment to the HIV-1 long terminal repeat and facilitates the assembly of the nuclear receptor corepressor 1 complex (62). HIV-1–infected patients have been reported to have altered expression of nuclear receptors (63), suggesting additional mechanisms by which HIV-1 infection can promote ectopic inflammation. RON signaling acts to maintain tissue homeostasis in part by activating genes that mediate wound healing while inhibiting genes that exacerbate inflammation (1). Additionally, RON induces the expression of small heterodimer partner 1, a negative regulator of TLR signaling (64), which would impact innate immune functions and clearance of opportunistic infection. Our initial studies with primary human tonsil macrophages in vitro have failed to demonstrate significant changes in TNF-α and IL-12p40 following HIV infection or RON knockdowns (data not shown), although further, more exhaustive cytokine profiling needs to be performed. Retention of RON expression in chronically infected macaques was correlative with diminished CNS inflammation and disease, indicating that RON expression may predict disease outcome in HIV-1–infected patients. We propose a model in which RON collaborates with other anti-inflammatory molecules, to protect tissue-resident macrophages and tissues, including the CNS, from excessive inflammation. However, this control is not absolute, and eventually HIV-1 infection circumvents these barriers to inflammation. By downregulating inhibitory molecules like RON, virus replication is enhanced, inflammatory cytokine expression is increased, and protective molecules such as Arg-1 are diminished, ultimately contributing to cell death and end organ tissue damage. We thank Garrett Jones for technical assistance. We are grateful to Dr. Ching-Ti Liu and the Boston University Medical Center Biostatistics Consulting Group for assistance with statistical analysis, as well as Dr. Michael Platt, Department of Otolaryngology at Boston Medical Center, for providing discarded tonsil tissues. The NL4.3 Nef + HSA-tagged virus was obtained from the AIDS Research and Reference Reagent Program, Division of AIDS, National Institute of Allergy and Infectious Diseases, National Institutes of Health. This work was supported in part by National Institutes of Health Grant AI097117 (to A.J.H.). vesicular stomatitis virus envelope glycoprotein.
. 2004. Receptor tyrosine kinases and the regulation of macrophage activation. J. Leukoc. Biol. 75: 731–737.
. 2002. Macrophage-stimulating protein and RON receptor tyrosine kinase: potential regulators of macrophage inflammatory activities. Scand. J. Immunol. 56: 545–553.
. 2002. Targeted disruption of the mouse colony-stimulating factor 1 receptor gene results in osteopetrosis, mononuclear phagocyte deficiency, increased primitive progenitor cell frequencies, and reproductive defects. Blood 99: 111–120.
. 2011. Ron receptor regulates Kupffer cell-dependent cytokine production and hepatocyte survival following endotoxin exposure in mice. Hepatology 53: 1618–1628.
. 1998. Proteolytic cleavage and activation of pro-macrophage-stimulating protein and upregulation of its receptor in tissue injury. J. Invest. Dermatol. 111: 573–581.
. 2000. Regulation of the RON receptor tyrosine kinase expression in macrophages: blocking the RON gene transcription by endotoxin-induced nitric oxide. J. Immunol. 164: 3815–3821.
. 2004. RON receptor tyrosine kinase, a negative regulator of inflammation, inhibits HIV-1 transcription in monocytes/macrophages and is decreased in brain tissue from patients with AIDS. J. Immunol. 173: 6864–6872.
. 2011. Regulation of macrophage arginase expression and tumor growth by the Ron receptor tyrosine kinase. J. Immunol. 187: 2181–2192.
. 2002. Activation of the stem cell-derived tyrosine kinase/RON receptor tyrosine kinase by macrophage-stimulating protein results in the induction of arginase activity in murine peritoneal macrophages. J. Immunol. 168: 853–860.
. 2010. Ron receptor tyrosine kinase negatively regulates TNFalpha production in alveolar macrophages by inhibiting NF-kappaB activity and Adam17 production. Shock 33: 197–204.
. 2004. Macrophage-stimulating protein, the ligand for the stem cell-derived tyrosine kinase/RON receptor tyrosine kinase, inhibits IL-12 production by primary peritoneal macrophages stimulated with IFN-γ and lipopolysaccharide. J. Immunol. 172: 1825–1832.
. 2008. The RON receptor tyrosine kinase regulates IFN-γ production and responses in innate immunity. J. Immunol. 181: 2303–2310.
. 1999. Negative regulation of macrophage activation in response to IFN-gamma and lipopolysaccharide by the STK/RON receptor tyrosine kinase. J. Immunol. 163: 6606–6613.
. 1997. Deregulated inflammatory response in mice lacking the STK/RON receptor tyrosine kinase. Genes Funct. 1: 69–83.
. 2005. RON-regulated innate immunity is protective in an animal model of multiple sclerosis. Ann. Neurol. 57: 883–895.
. 2008. Ron receptor tyrosine kinase-dependent hepatic neutrophil recruitment and survival benefit in a murine model of bacterial peritonitis. Crit. Care Med. 36: 1585–1593.
. 2002. The role of the receptor tyrosine kinase Ron in nickel-induced acute lung injury. Am. J. Respir. Cell Mol. Biol. 26: 99–104.
. 2002. STK receptor tyrosine kinase regulates susceptibility to infection with Listeria monocytogenes. Infect. Immun. 70: 416–418.
. 1992. Early viral brain invasion in iatrogenic human immunodeficiency virus infection. Neurology 42: 1736–1739.
. 1994. HIV-1 infection despite immediate combination antiviral therapy after infusion of contaminated white cells. Am. J. Med. 97: 289–295.
. 2006. Mechanism for the establishment of transcriptional HIV latency in the brain in a simian immunodeficiency virus-macaque model. J. Infect. Dis. 193: 963–970.
. 2011. Brain cell reservoirs of latent virus in presymptomatic HIV-infected individuals. Am. J. Pathol. 179: 1623–1629.
. 2005. The neuropathogenesis of AIDS. Nat. Rev. Immunol. 5: 69–81.
. 2012. The history of antiretroviral therapy and of its implementation in resource-limited areas of the world. AIDS 26: 1231–1241.
. 2009. Non-AIDS-defining deaths and immunodeficiency in the era of combination antiretroviral therapy. AIDS 23: 1743–1753.
. 2009. Coordinated regulation of SIV replication and immune responses in the CNS. PLoS One 4: e8129.
. 2007. CUGBP1 is required for IFNbeta-mediated induction of dominant-negative CEBPbeta and suppression of SIV replication in macrophages. J. Immunol. 179: 7262–7269.
. 2012. Canonical type I IFN signaling in simian immunodeficiency virus-infected macrophages is disrupted by astrocyte-secreted CCL2. J. Immunol. 188: 3876–3885.
. 2008. The receptor tyrosine kinase RON represses HIV-1 transcription by targeting RNA polymerase II processivity. J. Immunol. 180: 1670–1677.
. 2008. HIV-1 Tat mediates degradation of RON receptor tyrosine kinase, a regulator of inflammation. J. Immunol. 181: 1548–1555.
. 2008. The accelerated simian immunodeficiency virus macaque model of human immunodeficiency virus-associated neurological disease: from mechanism to treatment. J. Neurovirol. 14: 309–317.
. 1999. High viral load in the cerebrospinal fluid and brain correlates with severity of simian immunodeficiency virus encephalitis. J. Virol. 73: 10480–10488.
. 2011. Initiation of HAART during acute simian immunodeficiency virus infection rapidly controls virus replication in the CNS by enhancing immune activity and preserving protective immune responses. J. Neurovirol. 17: 120–130.
. 2011. A simian immunodeficiency virus macaque model of highly active antiretroviral treatment: viral latency in the periphery and the central nervous system. Curr. Opin. HIV AIDS 6: 37–42.
. 2006. Progressive selection for neurovirulent genotypes in the brain of SIV-infected macaques. AIDS 20: 197–205.
. 2010. Inhibition of TLR4-induced IκB kinase activity by the RON receptor tyrosine kinase and its ligand, macrophage-stimulating protein. J. Immunol. 185: 7309–7316.
. 1998. Arginase modulates nitric oxide production in activated macrophages. Am. J. Physiol. 274: H342–H348.
. 1988. Quantitative study on phagocytosis of human tonsillar adherent cells by the flow cytometric and immunocytochemical methods. Acta Otolaryngol. Suppl. 454: 108–112.
. 2002. Heterogeneity of freshly isolated human tonsil dendritic cells demonstrated by intracellular markers, phagocytosis, and membrane dye transfer. Cytometry 48: 167–176.
. 1976. A characterization of human tonsillar lymphocytes after separation from other tonsillar cells in an isokinetic gradient of Ficoll in tissue culture medium. Am. J. Pathol. 83: 341–358.
. 2005. Tissue-resident macrophages are productively infected ex vivo by primary X4 isolates of human immunodeficiency virus type 1. J. Virol. 79: 5220–5226.
. 1995. Infection of human tonsil histocultures: a model for HIV pathogenesis. Nat. Med. 1: 1320–1322.
. 1997. Kinetics of response in lymphoid tissues to antiretroviral therapy of HIV-1 infection. Science 276: 960–964.
. 2003. The contribution of monocyte infection and trafficking to viral persistence, and maintenance of the viral reservoir in HIV infection. J. Leukoc. Biol. 74: 635–641.
. 2009. A simian immunodeficiency virus-infected macaque model to study viral reservoirs that persist during highly active antiretroviral therapy. J. Virol. 83: 9247–9257.
. 2005. Uncoupling ligand-dependent and -independent mechanisms for mitogen-activated protein kinase activation by the murine Ron receptor tyrosine kinase. J. Biol. Chem. 280: 35098–35107.
. 2009. CNS inflammation and macrophage/microglial biology associated with HIV-1 infection. J. Neuroimmune Pharmacol. 4: 430–447.
. 2010. Regulation of SIV mac 239 basal long terminal repeat activity and viral replication in macrophages: functional roles of two CCAAT/enhancer-binding protein beta sites in activation and interferon beta-mediated suppression. J. Biol. Chem. 285: 2258–2273.
. 2006. Transcriptional profiling of the human monocyte-to-macrophage differentiation and polarization: new molecules and patterns of gene expression. J. Immunol. 177: 7303–7311.
. 2005. Transcriptional profiling reveals complex regulation of the monocyte IL-1 beta system by IL-13. J. Immunol. 174: 834–845. 2001. Arginase I expression and activity in human mononuclear cells after injury. Ann. Surg. 233: 393–399.
. 2001. Surgery induces human mononuclear cell arginase I expression. J. Trauma 51: 497–502.
. 2001. Reversing lipopolysaccharide toxicity by ligating the macrophage Fc γ receptors. J. Immunol. 166: 6861–6868.
. 2003. Fcgamma receptor-mediated suppression of human immunodeficiency virus type 1 replication in primary human macrophages. J. Virol. 77: 4081–4094.
. 2002. HIV-1 down-modulates gamma signaling chain of Fc gamma R in human macrophages: a possible mechanism for inhibition of phagocytosis. J. Immunol. 168: 2895–2903.
. 2007. FcgammaRIIa genotype predicts progression of HIV infection. J. Immunol. 179: 7916–7923.
. 2010. Nuclear receptor transrepression pathways that regulate inflammation in macrophages and T cells. Nat. Rev. Immunol. 10: 365–376.
. 2011. Nuclear receptor signaling inhibits HIV-1 replication in macrophages through multiple trans-repression mechanisms. J. Virol. 85: 10834–10850.
. 2012. HIV-1 infection is associated with changes in nuclear receptor transcriptome, pro-inflammatory and lipid profile of monocytes. BMC Infect. Dis. 12: 274.
. 2011. The orphan nuclear receptor SHP acts as a negative regulator in inflammatory signaling triggered by Toll-like receptors. Nat. Immunol. 12: 742–751.